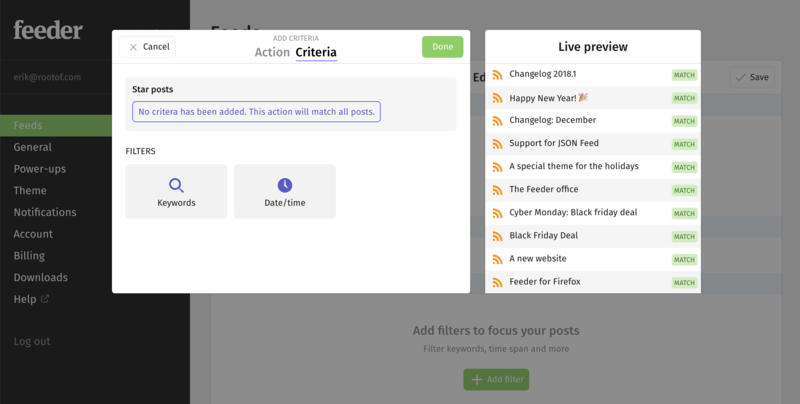 With Post Actions you can take action on posts that match certain criteria. Post Actions allow you to mark posts as read that aren’t interesting, or star posts that are very interesting. In this guide we’ll talk about how to set up Feeder Post Actions and common use cases. Post Actions are a Pro only feature. You can upgrade your account at any time by visiting the Billing section in settings. If you don’t have an account: It’s free to try Feeder Pro for 14 days! Before diving in: It’s important to remember that Post Action criteria and filters only apply to new posts. If you create a Post Action it will not retroactively apply to posts already in Feeder. 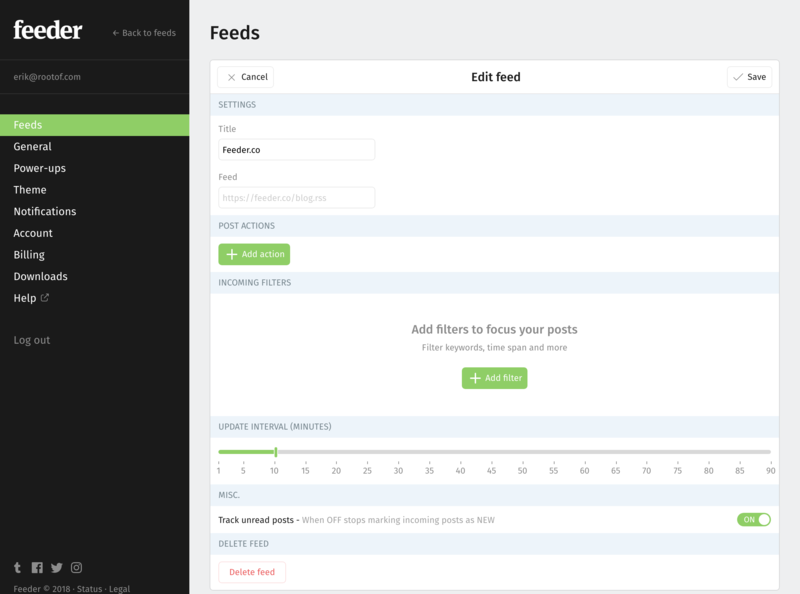 Visit the web settings page on https://feeder.co/settings/feeds to get started. You can add Post Actions while subscribing to a feed, or you can add/remove them at any time while editing a subscription. To get started click “Edit” next to the feed you wish to add Post Actions to. Click on “+ Add Action” to Add your first action. The first thing you need to do is choose what you want to happen. At this point you can choose what criteria to add. By default a Post Action will match all posts. You will notice this criteria selector from the Incoming Filter’s. They work the same way. For this Post Action we wish to Star all posts that contain the word “Changelog” in our official blog. While we’re doing this we can see in realtime how our criteria would match posts. This is useful to see if you accidentally added too many criteria so it didn’t match what you expected. Then press Save to save your changes. Post Actions are versatile ways to improve your workflow within Feeder, or to create new workflows entirely. 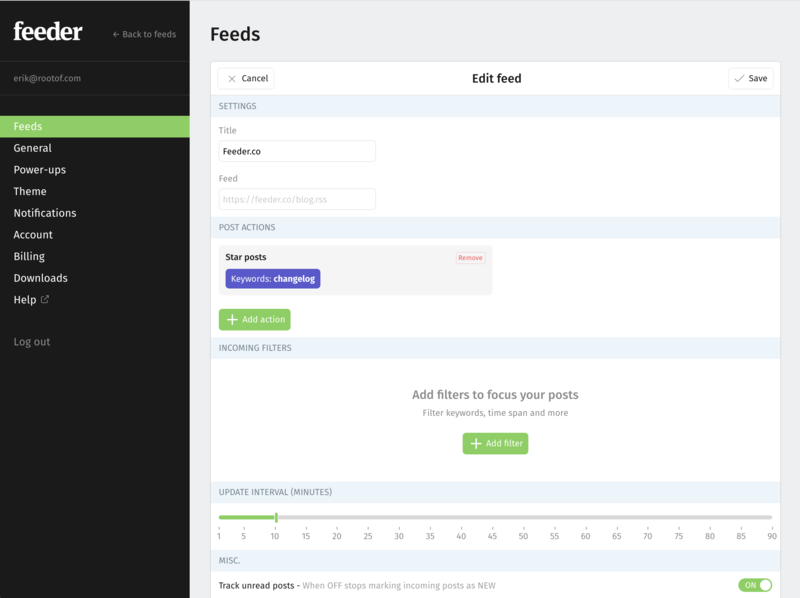 Example: With Post Actions you could use Feeder as a ticketing platform. Let’s say you have certain work hours, and an RSS feed connected to an internal system for support requests. You could then mark all posts as starred that come in between certain times of the day. Then you could use the Starred posts view to keep track of the tickets that you have yet to complete. Example: Mark all Posts as read to reduce the noise in your Unread list. For example, ignore updates from news sources containing keywords. They will still be visible in the feed’s post list if you wish to go back later and look. Example: Star all post from a feed to quickly access them. Let’s say you follow your children’s school blog, and don’t want to miss any updates. You can set up a Post Action to star all posts, and check the Starred post list to see important updates.